Yellow…the color of warmth, joy and comfort. Its association with the sun has made yellow a symbol of divinity and power in major religions and Greek mythology throughout the ages. Its companion color, gold, speaks also of power as well as wealth and importance and is enjoying a renaissance of it own in modern times. For what its worth, here is how we use yellow…and gold…in today’s interiors. This lovely kitchen is so cheerful and airy, thanks to the French Vanilla cabinetry, glossy painted wood ceilings, and abundance of natural sunlight streaming through the windows. 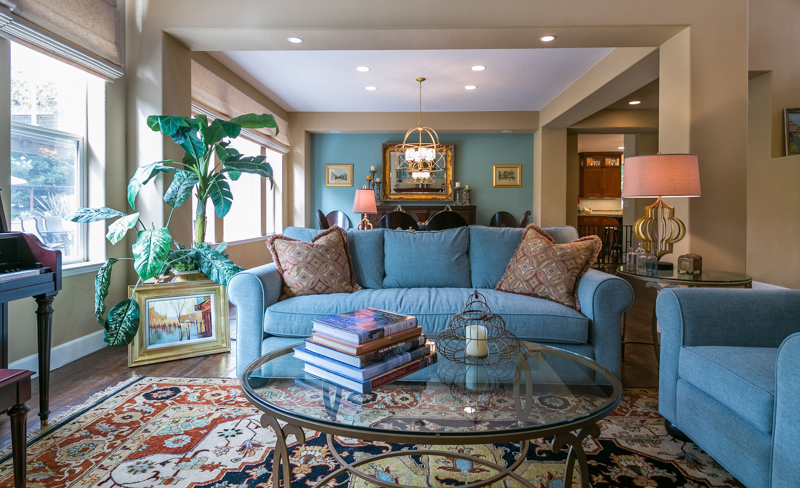 Lighter tones visually advance in a space, giving the appearance of a much larger room. Today, we know yellow as a friendly, energetic color. 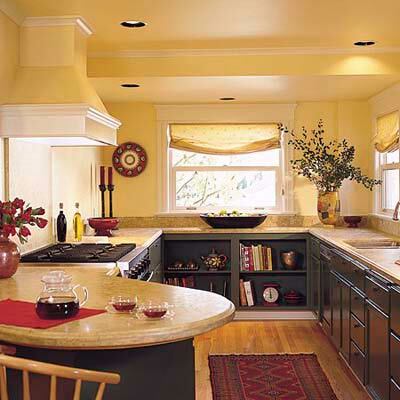 I love the use of yellow here against the charcoal cabinetry and the crimson red accents. Imagine if these walls and ceiling (love the colored ceiling!) were painted in white. There would definitely be a different more subdued feeling as you walked into this room. With yellow, you just want to get busy and cook in here! I love to use soft tones of butter or straw as a neutral on walls, which allows the artwork and furnishings to come alive. See how well it pairs with each individual color and the room as a whole. Yellow is the brightest and most reflective color on the color wheel and therefore a great choice to use in hallways and poorly lit or windowless areas. Mirrors, golden frames, and white ceilings also increase the brightness in this space. Such a lovely vignette! 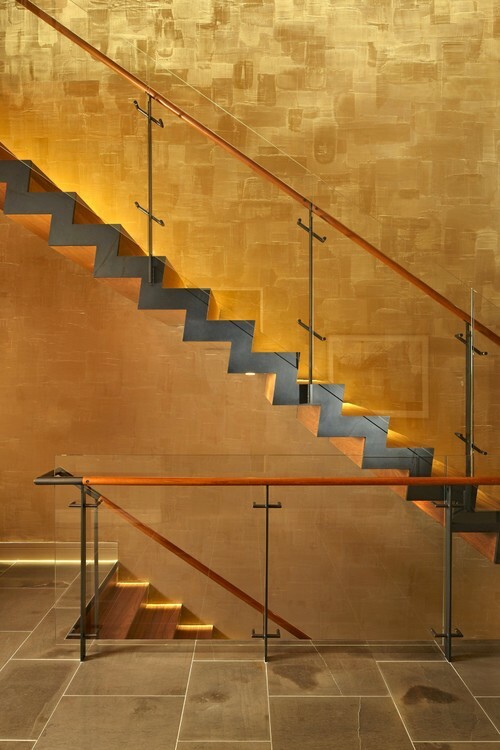 This modern staircase shimmers with gold leaf luxury. What a beautiful, sophisticated room the designer has created here through the use of tailored details like the banded draperies and box pleated chair. The elegant black walls and chaise could be overbearing and somber if not for the counter point of buttery yellow which lightens and brightens the mood of the room. A new trend in cabinetry offers personality plus when you open a drawer. 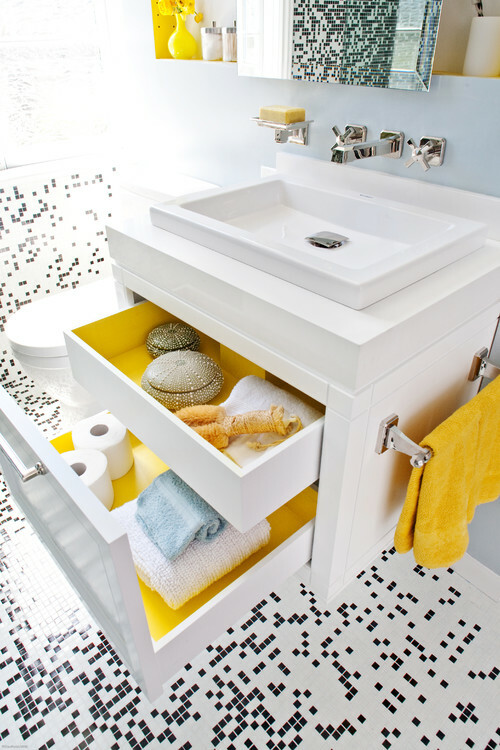 How much fun to pair black and white with citrine yellow — a perfect use for this sunny, happy color! Whether it’s marigold, French vanilla, butternut squash or corn silk, yellow will make your home feel lighter and brighter. What is your favorite shade of yellow?